Valentina, aubrieta, tulips, cobbles and pebbles. Looking so pretty Terra, as always. 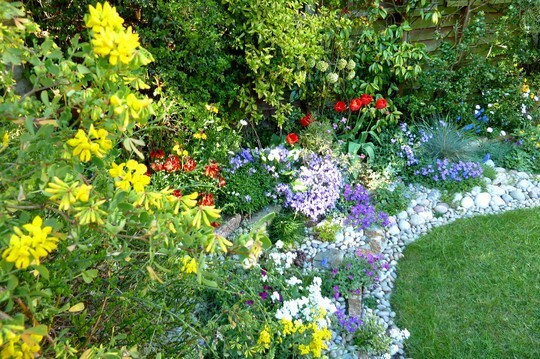 I love the way you have used rock planets and heathers in your garden terra...set off so well by the white pebbles. Do love a spring garden like this. Not my style I suppose, but beautiful! Yes, exactly! One of my neighbours in my old house had a front terraced garden that was always spectacular in the spring...full of au retinas, tulips, narcissi....the whole lot! I used to love it, and that's probably what I will do if I ever have a serious sunny slope! Lol. On GoYpedia it is aubrieta ... ! I'm pleased with my Pebble Garden ..
..turned out better than I had expected ! Stunning show Tt. I don't think I have seen Valentina before. It is all very bright and uplifting as the cold weather descends on us yet again. Thank you Amy, Scotsgran, Neena and Moti ..
Today the flowers are enjoying a quick rain shower. Wonderful show TT. Yes a spot of much needed rain here too! Hope it softens the earth so I can get some weeding done! Amazing Terra, so pretty ! At the moment I am at the just standing there and wondering where on earth to begin! Lol, sunny at the moment! Might go and re set the wildlife cam and am cooking for guests! Thanks Carole and Stripes .. The erysimum has produced further flowers now, giving more red colours to the mix ! Saw it Saturday, I think, Terra. Lol. Hi Mouldy .. yes ... Lol. I plan only small areas at a time..
ooooh .. I like that word !!! If you take a look at my recent blog ..
Esquisitely elegant! All the right plant heights in the right places...beautiful. Who designed this garden? I want one just like it. many thanks for your kind compliments. I designed the garden, a little at a time .. I don't start with a grand plan ..